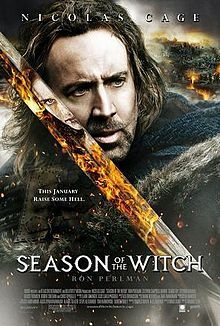 Shocktober continues, ultimate Nic Cage-style, with his “the guys burning witches were right all along” historical opus Season of the Witch. Meanwhile, Stuart takes us time-traveling to meet teenage Stu, Dan shows his encyclopediac knowledge of proper superhero terminology, andElliott takes us behind the scenes at Cleavage Magazine. 0:00 – 0:51 – Introduction, technical difficulties disclaimer, and SHOCKTOBER theme. 0:52 – 5:33 – Much discussion about Dan’s “area,” followed by premature, hubristic crowing about having our audio issues fixed. 5:34 – 30:30 – What could be more SHOCKTOBER-y seasonal than discussing Season of the Witch? 30:31 – 34:30 – Stuart continues to make a mockery of our SHOCKTOBER final judgments. 1:02:07 – 1:03:34 – Goodbyes, theme, and outtakes. Anyone figure out which episode features Stuart’s Night Court remake pitch? Also, I got really excited when “Head Of The Class” came up and I thought to myself, “I hope somebody makes an Arvid reference,” and then Elliott did. You need to work on your self-esteem, Ryan. Simone, I’m like a doctor, I’m doing very important work here. The Night Court discussion beings in Episode 55, roughly at 44:10.